Norwell, MA – November 3, 2010 – Clean Harbors, Inc. (“Clean Harbors”) (NYSE: CLH), the leading provider of environmental, energy and industrial services and hazardous waste management services throughout North America, today announced financial results for the third quarter ended September 30, 2010. Revenues increased 60% to a record $487.7 million from $305.6 million in the third quarter of 2009, reflecting the acquisition of Eveready Inc. on July 31, 2009, a strong contribution from the legacy Clean Harbors’ business and the Company’s oil spill response efforts in the Gulf of Mexico and Michigan. Income from operations increased 172% to $73.4 million from $27.0 million in the third quarter of 2009. Third quarter 2010 net income grew to $38.8 million, or $1.47 per diluted share, from $9.2 million, or $0.36 per diluted share, in the third quarter of 2009. 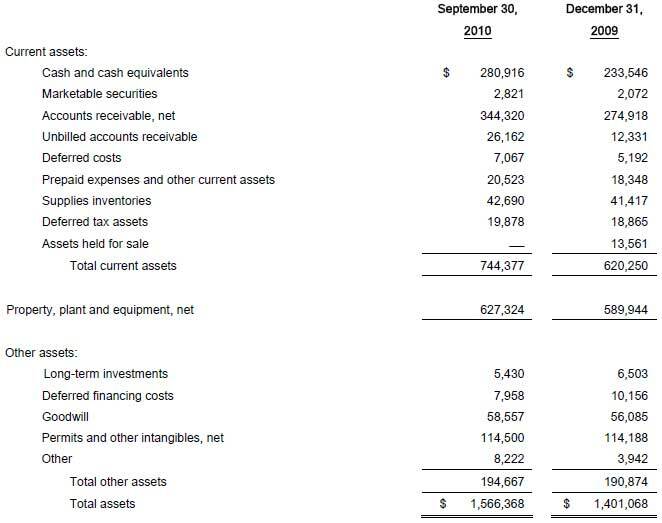 Third quarter 2010 net income included a pre-tax charge of $2.3 million for the early extinguishment of debt related to the Company’s redemption of $30 million of its outstanding senior secured notes. Third quarter 2009 net income included approximately $9.0 million in expenses related to the Company’s acquisition of Eveready and the early extinguishment of debt. Weighted average diluted shares outstanding used to calculate net income per share in the third quarter of 2010 were 26.5 million compared with 25.6 million in the same period of 2009. 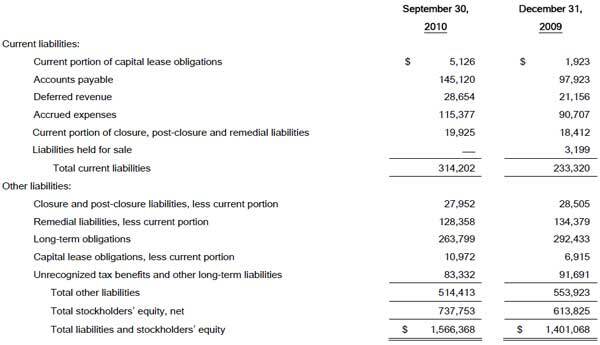 EBITDA (see description below) more than doubled to a record $98.8 million from $48.3 million in the third quarter of 2009. “Emergency response events accounted for more than 25% of revenue in the third quarter,” McKim said. “During the quarter, we continued to be heavily involved in the Gulf oil spill response effort. While our level of engagement steadily declined throughout the quarter, we still had more than 500 people working in the region at quarter’s end. In addition to the Gulf region clean-up, we participated in the oil spill response efforts in the Kalamazoo River area of Michigan during the quarter. At the peak level, we had approximately 450 response-related personnel in Michigan along with a broad range of our specialized equipment. These two major events have only served to further strengthen Clean Harbors’ reputation as a leading national provider of emergency response services. Based on year-to-date performance, current market conditions and the impact of the emergency response event in the Gulf, Clean Harbors is updating its 2010 annual revenue and EBITDA guidance. The Company currently expects full-year 2010 revenue in the range of $1.68 billion to $1.70 billion, up from its previous revenue guidance of $1.63 billion to $1.68 billion. The Company is currently estimating approximately $25 million in emergency response related revenue in the fourth quarter. 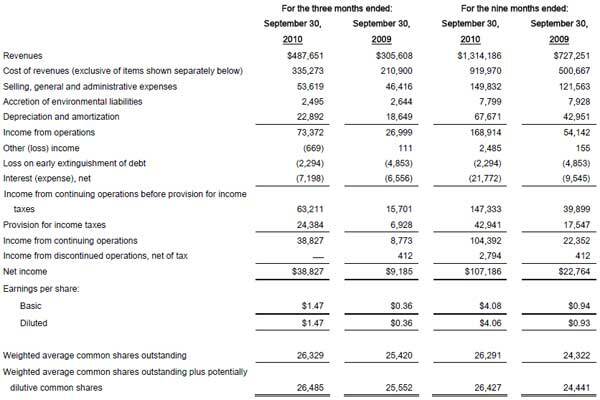 The Company also currently anticipates EBITDA for 2010 in the range of $305 million to $310 million, an increase from its previous guidance of $278 million to $288 million for the full year. Based upon preliminary estimates of the vertical markets it serves, the Company expects its 2011 revenues in the range of $1.52 billion to $1.57 billion, which represents a 5% to 8% increase over its 2010 base revenues, excluding the Gulf and Michigan spills. The Company expects its EBITDA margin to be approximately 17% at this level of growth in 2011, which translates into an EBITDA range of $258 million to $267 million, excluding any significant potential spill-related activity in 2011. As Clean Harbors completes its 2011 budgeting process in the coming months, it will update this preliminary guidance in conjunction with its fourth-quarter results in February 2011. Clean Harbors will conduct a conference call for investors today at 9:00 a.m. (ET) to discuss the information contained in this press release. On the call, Chairman, President and Chief Executive Officer Alan S. McKim and Executive Vice President and Chief Financial Officer James M. Rutledge will discuss Clean Harbors’ financial results, business outlook and growth strategy. Investors who wish to listen to the webcast should log onto www.cleanharbors.com/investor_relations. The live call also can be accessed by dialing 877.709.8155 or 201.689.8881 prior to the start of the call. If you are unable to listen to the live call, the webcast will be archived on the Company’s website. Clean Harbors is the leading provider of environmental, energy and industrial services and hazardous waste management services throughout North America. The Company serves more than 50,000 customers, including a majority of the Fortune 500 companies, thousands of smaller private entities and numerous federal, state, provincial and local governmental agencies. Within Clean Harbors Environmental Services, the Company offers Technical Services and Field Services. Technical Services provide a broad range of hazardous material management and disposal services including the collection, packaging, recycling, treatment and disposal of hazardous and non-hazardous waste. Field Services provide a wide variety of environmental cleanup services on customer sites or other locations on a scheduled or emergency response basis. Headquartered in Norwell, Massachusetts, Clean Harbors has more than 175 locations, including over 50 waste management facilities, throughout North America in 36 U.S. states, seven Canadian provinces, Mexico and Puerto Rico. The Company also operates international locations in Bulgaria, China, Singapore, Sweden, Thailand and the United Kingdom. For more information, visit www.cleanharbors.com. The effects of conditions in the financial services industry on the availability of capital and financing. Any of the above factors and numerous others not listed nor foreseen may adversely impact the Company’s financial performance. Additional information on the potential factors that could affect the Company’s actual results of operations is included in its filings with the Securities and Exchange Commission, which may be viewed on www.cleanharbors.com/investor_relations.